"This is a great summer salad that can be prepared ahead of time so you can enjoy the day." 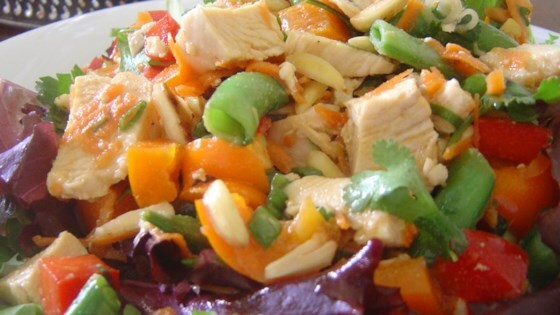 In a large bowl, mix together the onions, carrot, red pepper, peas, chicken, cilantro and almonds. Set aside. In a small bowl, whisk together the sugar, vinegar, sesame oil, teriyaki sauce and dry mustard until smooth. Pour over salad mixture and toss until coated. Serve in pita pockets or on a bed of lettuce. Crunchy, juicy, tasty chicken salad! Great salad! Just a little too spicy for me - I will use half the dry mustard next time. I also added a can of chopped water chestnuts. Thanks for the recipe! I found this to be very good, only I left off the dressing that was given and instead added a couple of tablespoons of mayonnaise, and served on bread like sandwiches. Delicious! This was good tossed with Napa (Chinese) cabbage. I also used it as a filling for the popular new "lettuce wraps." It was very good. This was very yummy. I substituted blanched asparagas for the snow peas because that's what I had on hand. I will make it again! Quite tasty. It's a nice summer dish. We enjoyed it, although I would add less sugar next time. It was a little too sweet for me.